Credit: Robert Bonde, USGS. Public domain. U.S. Geological Survey scientists have developed the first laboratory test that can pick up traces of manatees' genetic material in the waterways where they live. Using a water sample collected in the field, the innovative environmental DNA test can reveal whether one or more of the elusive marine mammals has been in the area within the past month. The test can detect the presence of manatees where other methods won't work, help scientists identify the habitats manatees use and the patterns of their seasonal movements, and inform efforts to bring back wild manatee populations that are considered close to extinction, such as in Brazil or West Africa, said USGS research geneticist Margaret Hunter. "Environmental DNA detection is the wave of the future for monitoring species that are difficult to find," Hunter said. "Some species, such as marine mammals, live in places where humans can't easily follow them. Others are few in number and widely dispersed, well camouflaged, or good at avoiding contact with people. By combining new advances in eDNA work with other techniques, we're getting a more complete picture of these wild populations, without disturbing them." Hunter led a research team that isolated a unique DNA segment found in manatees' body residues, such as saliva, skin cells, excrement and exhaled water vapor. The team developed a genetic marker that signals the presence of those DNA segments in a concentrated water sample from the animals' environment. Their work is reported in a scientific paper published March 13, 2018 in the journal Endangered Species Research. "In some instances manatees just cannot be detected even though we know they're there," Hunter said. "But our study found that eDNA surveys improved the detection of manatees in the wild, compared to the more traditional aerial survey methods. And it is relatively easy for field biologists to collect the samples, even though the methodology in the lab is not easy." Hunter began developing the eDNA test in the fall of 2013. 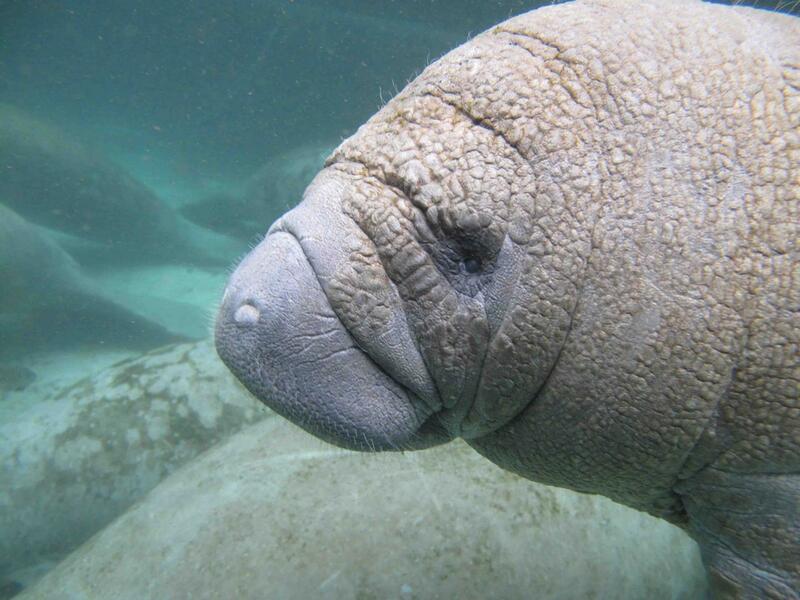 Using a database of wildlife genomes that have already been sequenced and tissue samples taken from living animals or carcasses, the team identified DNA sequences that are unique to manatee. The researchers developed a genetic marker that gives off fluorescent light in the presence of manatee DNA. A fragment of the manatees' genetic material – just 69 DNA base pairs, out of a total of 16,882 DNA base pairs – is enough to produce a reliable result, Hunter said. The probe was tested on concentrated water samples from an area on Florida's East Coast where manatees congregate, in the Florida Panhandle, where they are less numerous, and at locations in Guantanamo Bay, Cuba and Lake Ossa, Cameroon, where observers sometimes see the animals in the water. Some samples came from salty or brackish bays and lagoons, others from freshwater lakes and bayous. Taking care to avoid contamination with stray DNA, the team filtered water samples and concentrated the DNA. The samples were analyzed in a quantitative DNA detector, a state-of-the-art device which separates each water sample into as many as 20,000 droplets and analyzes each of them for traces of manatee DNA. The probe detected manatee eDNA at all six Florida locations and all five in Guantanamo Bay, but at just one location in Cameroon. It was not affected by salinity levels. But in waters rich in organic matter, such as forested lagoons, high levels of tannins and other natural chemicals in the water sometimes interfered with the probe, the researchers found. And there is another caveat: the probe "gives us the concentration of manatee DNA in our water sample, but it can't yet tell us how many animals are present," Hunter said. "It could be detecting one animal right next to you or ten animals upstream." The researchers' potential next steps include refining the manatee probe and developing similar probes for the dugong, a related species, or for other marine mammals.